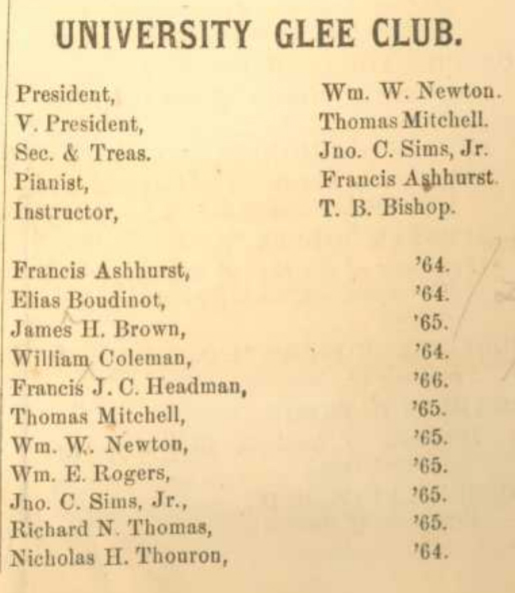 The Glee Club was founded on Tuesday, November 5, 1862, by eight University of Pennsylvania students as an “association for the furthering of [their] musical talents.” These men were members of the College Classes of 1864 and 1865, and their collegiate experience was greatly impacted by the American Civil War. 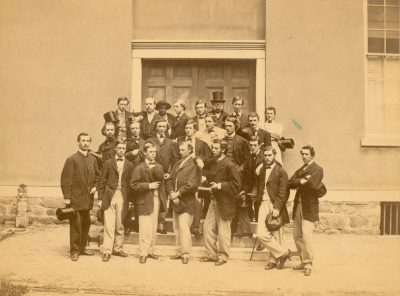 According to the 1865 University Record, though the Class of 1865 altogether included sixty members, so many left as a result of the war that only twenty four remained at graduation. Despite the upheaval of war, the Glee Club’s founding members’ years at Penn were an exciting time of development for student life at the University, particularly in regards to extracurricular activities, and much of it was spurred on by the students themselves. In addition to forming the Glee Club, they began such customs as Class Day, Senior Honor Awards, and the Bowl Fight, and also participated in Penn’s first intercollegiate athletic events. The Class of 1865 also produced Penn’s first printed yearbooks, the 1863 University Society Record and the 1865 University Record. Prior to these developments, student organizations at Penn had consisted only of two literary societies and four fraternities. The founding members of the Glee Club, five of whom graduated with their class, all went on to success in their chosen professions: a doctor, a legal expert, a judge, two railroad executives, and several clergymen. 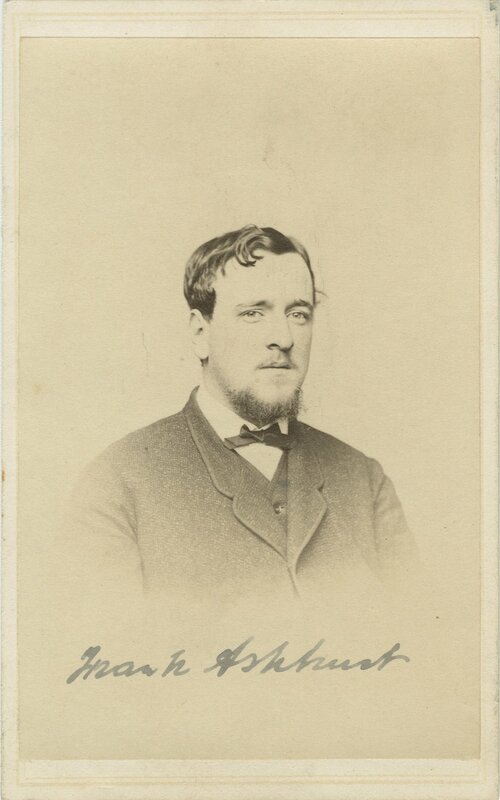 Francis Ashhurst (M’1867) was born in Philadelphia on January 5, 1844, the son of Lewis Richard Ashhurst of the Class of 1824 and Mary Hazelhurst. He entered the University of Pennsylvania as a member of the Sophomore class in 1861 and left at the end of his Junior year without having received a degree. Ashhurst would, however, go on to receive his medical degree from Penn in 1867. Ashhurst practiced medicine from 1874 until his death and founded Memorial Hospital of Burlington County in Mt. Holly, New Jersey, in 1880. He died in Mt. Holly on August 17, 1885. Bates entered as a sophomore member of the Class of 1865 in 1862, and left at the close of his junior year. While at Penn, Bates was a member of the Phi Kappa Sigma fraternity and the University Chess Club. During his sophomore year he was president of the Class of 1865 and vice-regent of the Zelosophic Society. 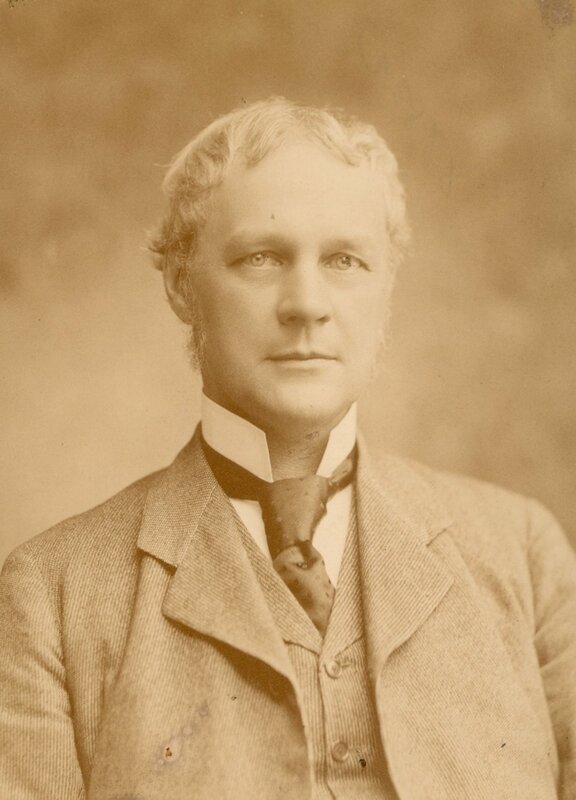 In 1867 and 1868 Bates studied at Harvard Law School, where he was awarded the prize for the best essay. As a lawyer he became the Assistant Attorney General of the state of Delaware from 1869 to 1874 and Speaker of the House of Representatives in Delaware in 1883. Subsequently he was employed by the federal government as the United States Commissioner to Samoa and Tonga in 1886, and as Special Envoy Extraordinary and Plenipotentiary for the U. S. at the 1889 international conference at Berlin concerning affairs in the Samoan Islands. A staunch Democrat, he represented Delaware on the Democratic National Committee and was a delegate to the Democratic conventions in 1880, 1884, and 1888. Bates was also one of the organizers and one-time president of the American Bar Association and chairman of the international law committee of that organization. After his retirement in 1896, he became the author of several legal textbooks. James Hutchings Handy Brown was born in Philadelphia on December 16, 1844, the son of David Paul Brown and Emmeline Catharine Handy. Brown entered the University of Pennsylvania in the spring of 1862, as a second term freshman in the Class of 1865. Brown was a vice president of his sophomore class and a member of the University Chess Club and of his sophomore class crew team, known as the Sophomore Barge Club. He served as president of the Zelosophic Society and as president of his senior class, thus presiding over the first Class Day exercises held at Penn. Brown became an Episcopal clergyman, officiating in Pennsylvania as well as in Albany and New York City in the state of New York, Washington, D.C., Maryland and Delaware. He was also a missionary in northern California and, from 1873 to 1884, a chaplain in the U. S. Navy. James H. H. Brown died in December of 1898. Thomas Mitchell was born in Philadelphia on April 17, 1845, the son of John Cowell Mitchell (Class of 1835) and Rebecca Nicholas. Mitchell entered the University in 1861 as member of the Class of 1865. He was a member of the Phi Kappa Sigma fraternity and vice president of the Glee Club. During the Civil War, Mitchell was a first Lieutenant in the University Light Artillery and also commissioned as a first Lieutenant in the 198th Pennsylvania Regiment of the United States Volunteers. He was captain of the University Light Artillery in his senior year at the time he left the University for military service. In May of 1865, Mitchell served on the staff of General Joshua L. Chamberlain. Before being mustered out on June 4, 1865, he was acting Assistant Adjutant General for the Brigade at the surrender of Robert E. Lee. He became a lawyer and then, in 1879 and 1880, a judge of the First Judicial District of Colorado. Thomas Mitchell married Lucy Breck Reed. He died in 1909 in Mayfield, California. William Wilberforce Newton was born on November 4, 1843 in Philadelphia, the son of Rev. Richard Newton (Class of 1836) and Lydia Gretorex. During the Civil War emergency of 1863, Newton served as a private in Landis’ (Pennsylvania) battery. After graduation Newton attended the Episcopal Divinity School in Philadelphia before serving as an Episcopal clergyman in various places including Newark, New Jersey, Boston, and Pittsfield, Massachusetts. Newton authored numerous religious texts and several cantatas. He was awarded an honorary D. D. degree by the University of Pennsylvania in 1890. Newton married Emily Stevenson Cooke. He died in Brookline, Massachusetts in 1914. Rogers entered the University in 1861 as a member of the Class of 1865. He became a member of the Philomathean Society and the University Glee Club. During his sophomore year, Rogers was vice president of his class and ranked second in his class academically. A corporal in the University Light Artillery, he left at the close of that academic year to enter the United States military. After his military years, Rogers entered the lumber business in Detroit, Michigan. Here he helped to organize Presque Isle County, the county seat of which is named Rogers City in his honor. In 1875 he moved to Garrison, New York, (outside New York City) to work as a cotton exporter; in 1883 he was appointed railroad commissioner of that state. Later, William Rogers was employed by the Delaware, Lackawanna, & Western Railroad Company. Rogers married Susan Le Roy Fish, daughter of Hamilton Fish, the governor of New York and former Secretary of State (under President Ulysses S. Grant). William Evans Rogers died on Monday, March 10, 1913 in New York City. John Clark Sims was born in Philadelphia on September 12, 1845, son of John Clarke and Emeline Marion Sims. When young Sims entered Penn’s Class of 1865 as a sophomore in 1862, he immediately took on a leading role in the organization of student life. During his sophomore year he was secretary of the Class of 1865, secretary and treasurer of the University Glee Club, as well as a member of the University Chess Club, the Philomathean Society and Phi Kappa Sigma fraternity. As a member of the Executive Committee of his senior class, Sims was instrumental in the establishment of Penn’s first Class Day. After his admission to the bar in 1868, Sims entered the service of the Pennsylvania Railroad Company as the assistant secretary. He later rose to become secretary of this company as well of several other railroad companies. Outside of his professional life, Sims served as a Trustee of the University of Pennsylvania and as a manager of the University Hospital, the University Veterinary Hospital and the Girard Trust Company. He was also the accounting warden for St. Paul’s Episcopal Church in Chestnut Hill and a lay deputy to the Diocesan Convention. Sims’ interest in the University did not flag after his graduation. He was greatly involved in Penn athletics as President of the University of Pennsylvania Athletic Association and of the Pennsylvania Railroad Athletic Association. He became instrumental in cricket matters while serving on the committees managing some of the most important international matches of the day. At the time of his death he represented the Trustees of the University on the Faculty Committee on Athletics. He served as a trustee of the University from 1885 until his death on January 6, 1901, at the University of Pennsylvania Hospital. At the time of his death he represented the Trustees of the University on the Faculty Committee on Athletics. In addition, John C. Sims was a member of many of the most respected organizations in Philadelphia and the northeastern United States. He was a member of the Society of Cincinnati in the State of New Jersey as well as the Philadelphia Society Sons of the Revolution. Sims was also a member of the Society of Colonial Wars, the Academy of Natural Sciences of Philadelphia, and the Germantown Cricket, Philadelphia, University and Penn Clubs. When Sims died in the University Hospital on January 6, 1901, he left a legacy that still leaves its mark on Philadelphia today. Sims married Grace Ledlie Patterson, the daughter of Joseph Patterson, the president of Western National Bank in Philadelphia. Their son Joseph Patterson Sims (1890-1953) earned the degree of Bachelor of Science in Architecture at the University in 1912. As an Episcopal priest, Thomas served St. Matthias Church, Trinity (Marylandville) and St. Phillip’s Church, all in Philadelphia. He was also for many years the editor of the American Sunday School Magazine. Thomas died in Philadelphia on June 2, 1905. He and his wife, Clara L. Horstmann, had a son, Walter H. Thomas, who graduated in the class of 1899.